Jean-Antoine Watteau was the innovative artist who extended Rococo beyond architecture, interior design and sculpture to the canvas. 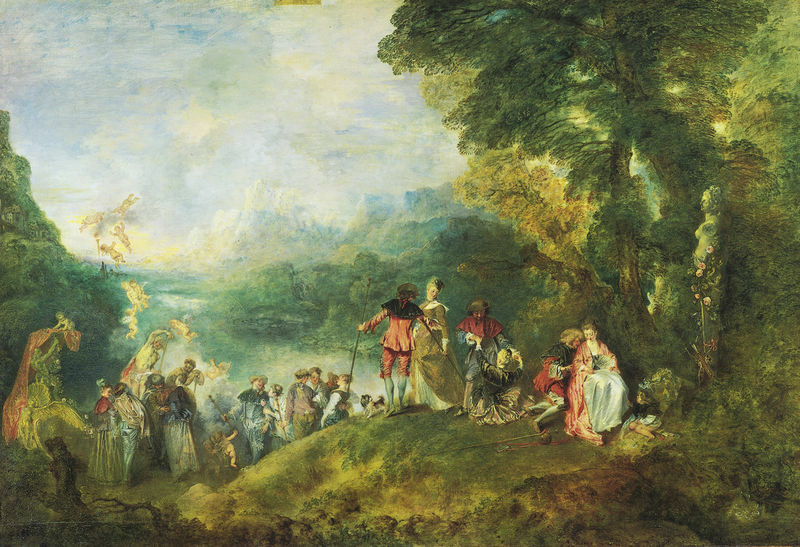 The notable elements that make Watteau's style unique are the combination of his lofty content and brightly colored landscapes. Watteau incorporated characters from the theater and musicians in both his paintings and drawings and his unusual work inspired the creation of a new category of painting upon his acceptance to the Academie de Peinture in 1717. 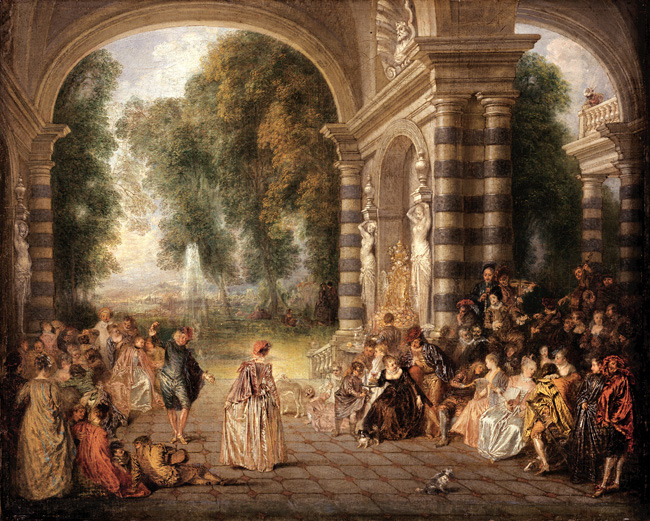 Watteau's paintings show humans living in harmony with nature. The characters of the Italian Commedia dell'Arte inhabit the canvas either reenacting scenes from the theater or as characters of the actual theater. Perhaps because the content of his subject was so innovative (a reversal of the more serious Baroque art from the previous century), not much attention is paid to the form of his figures in his paintings as is paid to his drafts. Watteau is probably best known for his use of color, as he offered such a bright palette. He revived palettes previously seen in 16th century Venetian paintings (as homage to Rubens) and his use of such colors, paired with his idealized, flirty themes and aesthetics of Rococo decor floored critics of his day. He entered the Academie de Peinture under his own category, Fetes Gallant (gallant party) as no works before him were even remotely similar. 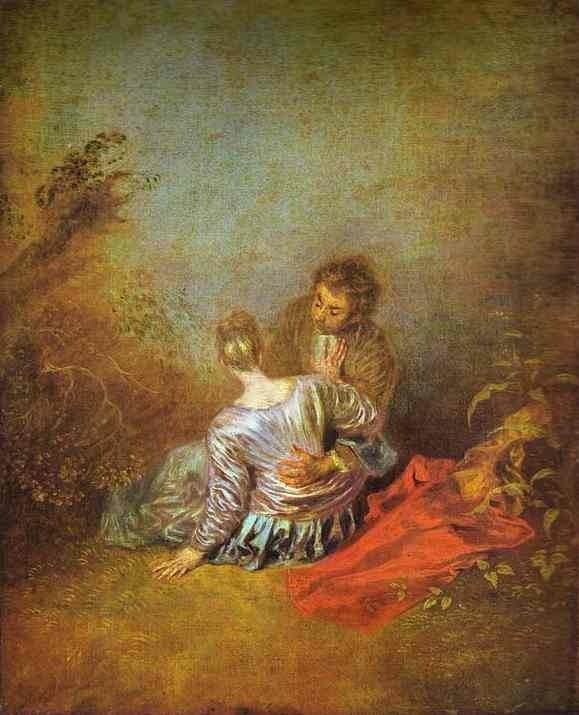 Watteau's use of lighting varies from piece to piece. In particular, his use of shadows in Pierrot is particularly heavy. 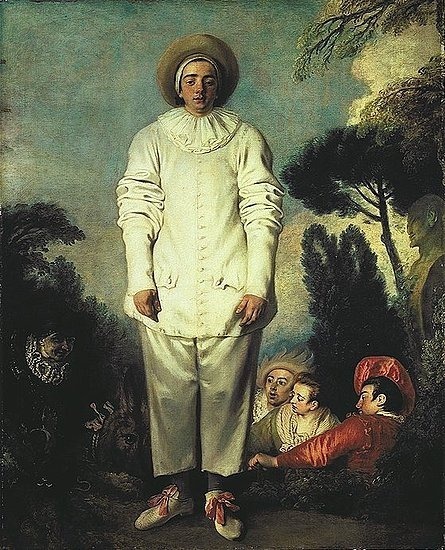 While the face of the sad clown for the most part remains in the shadow, the right side more heavily than the left, it is unusual that Watteau chose to highlight the insignificant portions of the character. The artist draws attention to what is clearly the most unflattering part of the character, his overinflated midsection. Perhaps Watteau was more greatly noted for his subject matter and color than his technique. 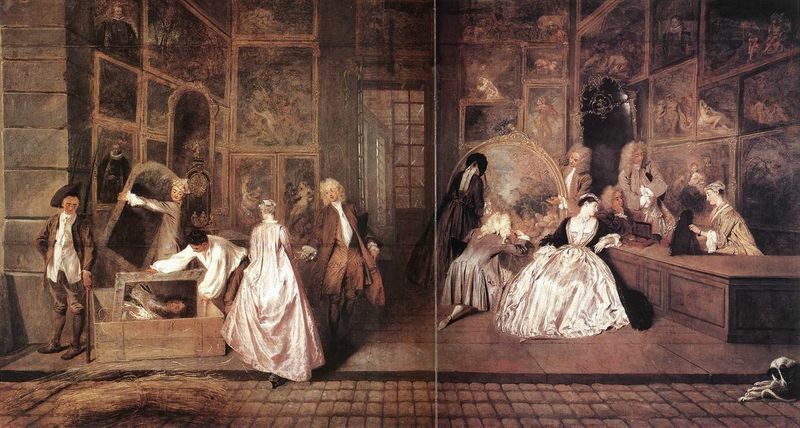 Critics have challenged his stylistic ability and have accused Watteau of being "deficient in the art of composition. " He had yet to conquer portraying figures in depth. In his larger works, groups are often painted in rows and only in his smaller works, are the figures in the same plane. Watteau does, however, execute the challenge of depth quiet successfully in the Embarkation for Cythera. Here, his departing figures vanish down the side of the bank and reappear by their boat, thus avoiding the problem of the middle distance, a technique borrowed from mannerist painting. When it came to form, Watteau did not see in flowing curves but in tight, straight lines. The substructure of even his quick sketches is severe. Rectilinear severity in L'Enseigne de Gersaint is displayed with the standing lady and the kneeling connoisseur. All the figures, except the packer in the white shirt, have an underlying sharpness of accent. The perspective of Watteau's paintings is relatively simple. His viewpoint is head-on, or at eye level for the viewer. Even the characters that are turned in three quarter positions do not display any more complex techniques like foreshortening. He paints his figures close to true to life with proportionate bodies, all relative in size to another. Watteau was perhaps one of the most brilliant and innovative draftsmen of the eighteenth century, displaying a fascinating talent with the "trois-crayons" or "three-chalk" technique. His drawings have the rich coloristic effects of painting. The Seated Woman is a prime example of his mastery of the technique. In his other drawings, black is more dominant than the red as seen in the Study of a Woman Playing the Guitar. The delicate grays of the graphite may seem dull in comparison to intense blacks, but Watteau added just enough touches of red to offer variety to the black. 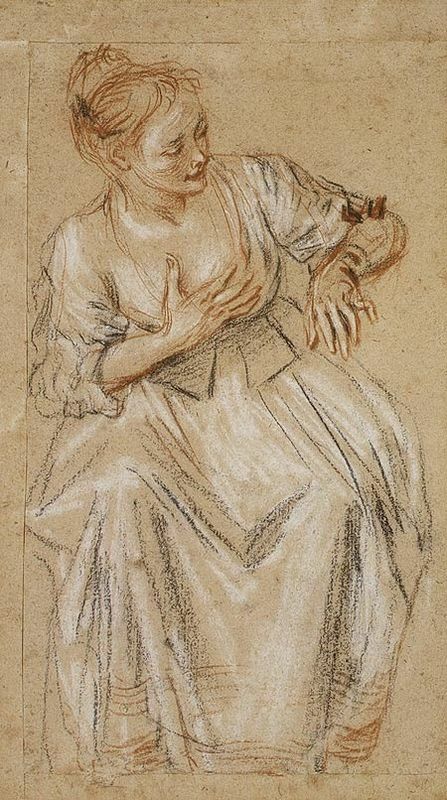 This was seldom done in drawings, proving that Watteau mastered this medium just as well as red chalk. Take note of the brightness of the lighting effects, the fullness of the forms, the convincing draperies, and the shine of the hard surfaces. Resemblance is noted between the model of this sheet and the woman who posed for the Embarkment for Cythera. 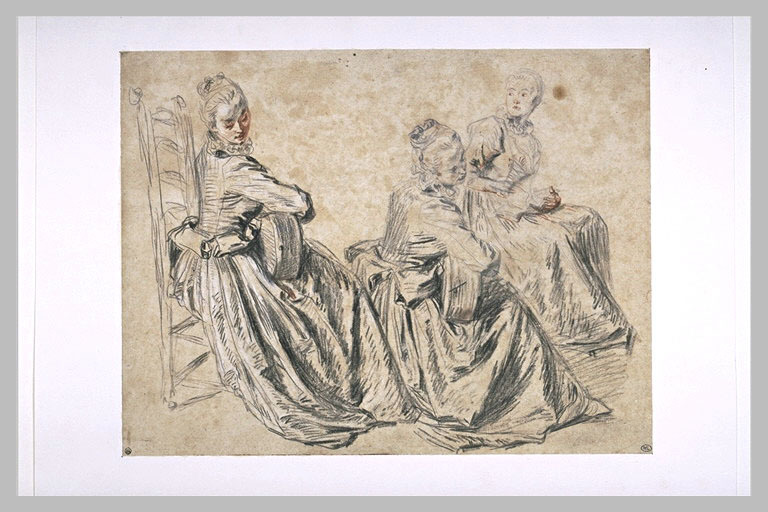 Like Rubens, Watteau's drawings were sometimes used as preparatory studies for a painting.